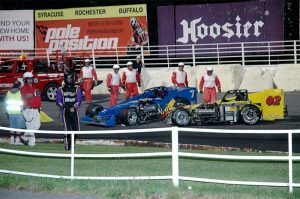 On the heels of three straight top-5 finishes to open the 2016 season, Otto Sitterly and the John Nicotra Racing team experienced a setback in Saturday’s Spring Championship 50-lap Novelis Supermodified main event at Oswego Speedway. Otto’s started the Royal Purple / G&I Homes / Riccelli Northern #7 in the 10th position and fought hard throughout the first half of the race. With passing at a premium in 2016, Sitterly made some moves to advance past Brandon Bellinger for 7th on lap 27, and then around Dave Gruel to move into 6th on lap 35. With Oswego track championship rival Michael Barnes not far behind throughout the race, Otto stayed up on the wheels and applied pressure to Michael Muldoon for the last slot in the top 5 with under 15 laps to go. But on lap 37 Otto slid the #7 sideways between turns 1 and 2, collecting Bellinger in the process and sending the Sitterly’s Hawk Jr chassis to the pit area. The Nicotra Racing team made quick repairs for Otto, only losing a handful of laps. Sitterly resumed the action with less than 10 laps to go, and rode for several circuits to collect any additional points that were salvageable, before pulling the car pit-side for good. The race resulted in a P12 finish for Otto, his first time finishing outside the top 5 in four starts this year. Sitterly finished P3 in his heat race, and now sits 11 points behind Barnes in the Novelis Supermodified point standings. A lot of points are up for grabs in the next race – Saturday, June 18 – with Twin 35-lap features on the night’s agenda. After a disappointing Spring Championship, Otto will be gunning for his first win of 2016. John Nicotra Racing is a Supermodified race team owned by John Nicotra and maintained by driver and chief mechanic Otto Sitterly. 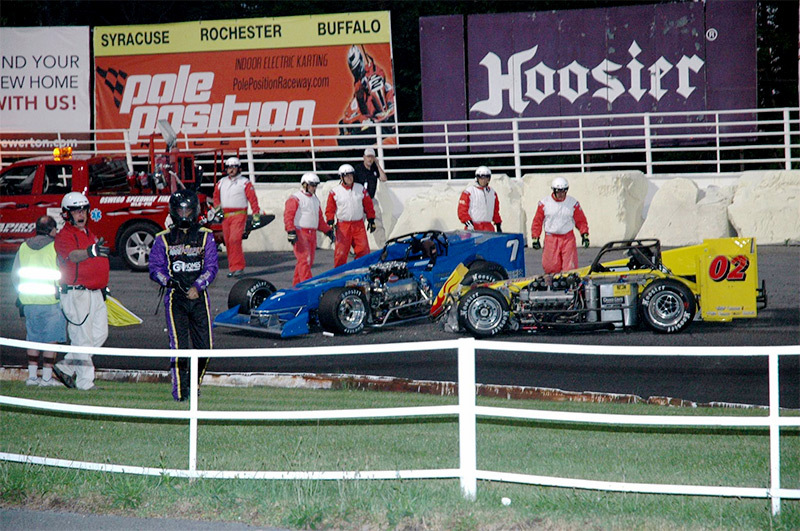 Nicotra Racing is based in Homestead, Fla., and Canajoharie, N.Y., and has won four International Classic 200s, six Oswego Supermodified track championships and now 25 regular-season Oswego feature races since their debut in 2007. Nicotra Racing is proud to be sponsored by G&I Homes, Royal Purple Synthetic Oil, Riccelli Northern, 5 Brothers Produce, Burnac Produce Limited, Provincial Fruit Co., Flavor First, Georgia Crate & Basket, Rite-Pak Produce, Quality First Produce, Sam Accursio Farms, Ritz-Craft Homes, Torbert Farms, Elite Harvesting, Green Bean Packers and Sunrise Growers.